We love us some Chris Pine here at Glam Book Shots, and Chris Pine loves him some books. SO. We'll give him some extra love today. Picture #1! 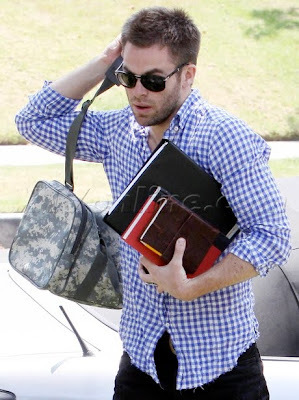 Chris Pine being hot with a hot book subtly hidden between a planner and a binder. It's okay for your accessories to be subtle when you're that hot. And Chris Pine #2! Okay, okay, he doesn't actually seem to have a real book in this picture but--there are notebooks! And have we mentioned he's hot? We'll bend the rules slightly. Okay then. The book is definitely what makes him hot.